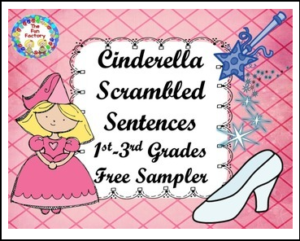 Cinderella Scrambled Sentences with a total of 33 cards for students to arrange in the correct order. Each set of sentences has the same picture so students will be able to separate the words into the correct sentences. There also is a recording sheet and answer sheet to use if you want your students to monitor their own learning. Enjoy!